Yesterday evening, when walking back to the PATH, I saw a restaurant with a kitten in the window, pining for attention. Above him, taped to the window, was a sign that said “SORRY! 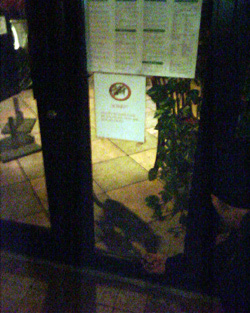 No pets inside the restaurant as required by the NYC Board of Health.” Apparently the owners’ pets are okay, but customers’ pets are not. In the picture you can see the kitten, sign and me. Apologies for the poor photo. Like a dolt, I didn’t have my CF card for my camera, so this picture was taken on a camera phone.